Comment Although we are not sure of the veracity of the above news or the extent of the Qatar involvement, we are not surprised by Aite Isaias Afeworki's behavior of capitulating on the 11th hour! If you remember Isaias accepted the Badme cease fire and the Algiers agreement on the 11th hour! With a tightening sanction by the World body Isaias may have decided to use his time tested method to live another day!. It will be interesting to know Ethiopia's reaction to Qatar's presence on its door step given the Nile Politics of the day and the fact that Ethiopia has severed its diplomatic ties with Qatar a year or so ago! 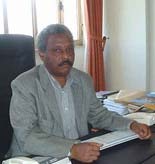 Interview with President Tsegay Berhe from Tigrai Regional state, Ethiopia. The outgoing regional president shares his thoughts on election 2010 and his legacy as Regional governor as well as TPLF/EPRDF senior leader at gezategaru pal talk room. As you all know many EPRDF veteran leaders are voluntarily passing the leadership role to the young generation. President Tsegay is one among the few senior leaders who will be taking different assignment come next September! The president listed many of the accomplishments of his party over the years and disagreed with the notion that the people voted for TPLF simply because the opposition was not better or �unknown angel�! at alula aba nega pal talk room! Ato Ujulu is from Gambella Ethiopia currently residing in Canada. Ato Ujulu candidly spoke on election 2010, EPRDF and developments in his native region Gambella. He told the online audience that he has no problem if people can ask for more and demand EPRDF to do more but he has a problem with people who politicize every criminal and personal quarrel. የግንቦት 20 ልዩ ዶከመንተሪ ፕሮግራም (ክፍል 1) Friday, May 28, 2010. Is this true Dr Beyene?! This joke is doing the rounds in Ethiopia after an almost embarrassing landslide victory for the governing EPRDF party and its allies left the opposition with just a lonely brace of seats in the 547 member parliament. A new beginning for Diaspora: AYAA set a record of attendance and fund raised. 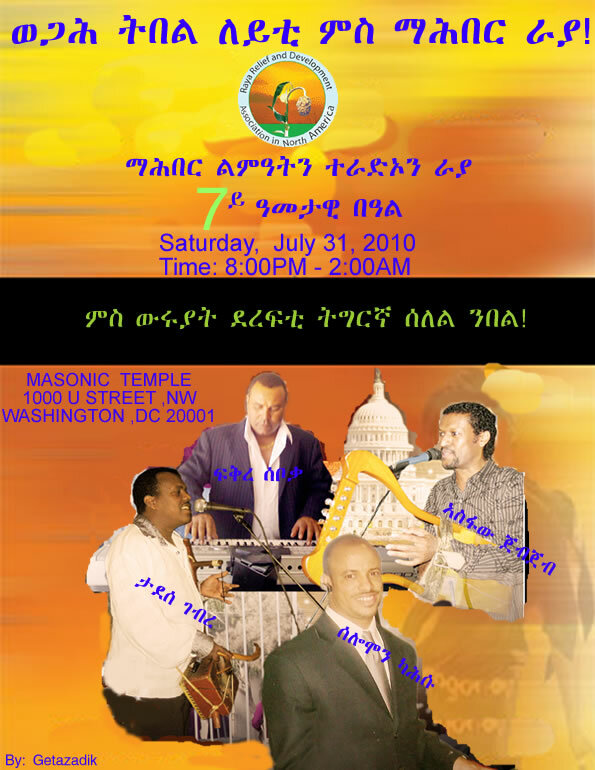 Washington DC May 30, 2010(Aigaforum) - The Atse Yohannes Alumni Association (AYAA) since its inception has been holding its annual get together every year in the month of May. May also is a historic month for Ethiopians! The repressive Mengistu Hailemariam government was defeated on May 20th 1990! Ethiopia also holds its national election in the month of May. Infact Ethiopia just concluded a historic fourth election a week ago. 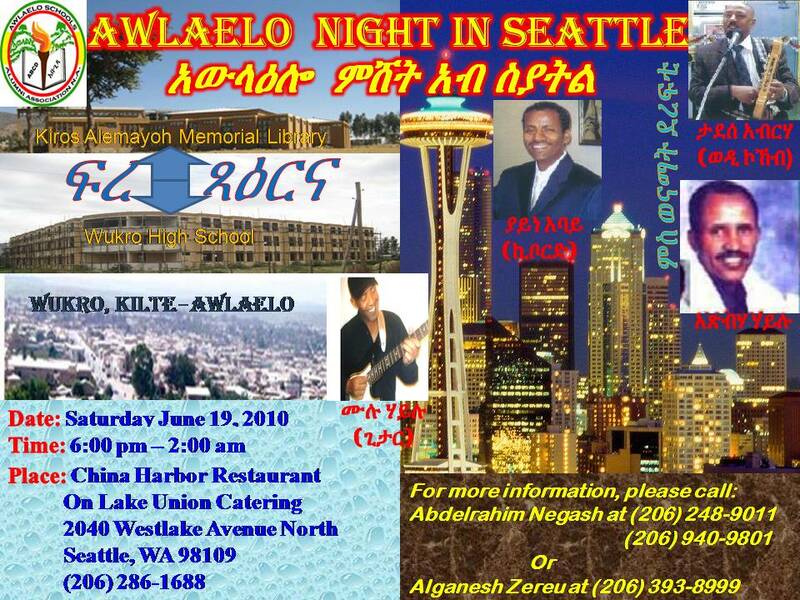 The fund raising event is held on the 29th of May 2010 at the Ethiopian Embassy in the presence of his excellence Ato Hlawi Yosef board chair man of the all Amhara Region Development Association. On the day a record amount of more than �13,000 pounds similar to more than 260,000 birr is raised and pledged. France on Monday bids to shore up its dwindling clout in Africa at a summit designed to launch a renewal of Franco-African ties and enlist big business in development....Giving Africa a strong voice in world governance will be a key topic and Ethiopia's Meles Zenawi chairs a round-table discussion on climate and development with a view to cementing a united Africa stance ahead of a key meeting in Cancun, Mexico later this year. May 31, 2010 -- The east African nations of Rwanda and Burundi have both asked human rights researchers from a New York-based organization to leave their countries within weeks of each other, an official said lastweek. May 31, 2010 /Washington DC/ The 19th anniversary of the downfall of the brutal military junta and the dawn of a new era of peace, democracy and development in Ethiopia was colorfully celebrated at the premises of the Ethiopian Embassy in Washington DC last Saturday, May 29, 2010. Why Human Right Watch Eagerly waiting for an African Blood in the aftermath of every election? The Anatomy Of A Political Landslide: How The EPRDF Won! "Human HRW the Global Bandit and the EU-EOM Symphony Orchestra... by Ben D"
Human Rights Watch: A Modern Day King Maker Gone Amok!